Helps prevent the body from storing fat. This new formulation combines substances known to prevent the accumulation of body fat, with recently developed herbal extracts that enhance their effect. ¤ Meratrim™ is a combination of two plant extracts, Sphaerantus indicus and the fruit rind of Garcinia mangostana. - When combined, these two plant extracts have a specific tropism on adipocytes or fat cells, particularly those in the abdominal area. They target formation of new adipocytes, inhibiting increases in their numbers (lipogenesis). - Meratrim™ then breaks down these fat cells - a process called lipolysis. - To achieve maximum results, both in terms of weight and inch loss, an average beneficial dose would be 800mg, combined with moderate daily exercise, and a calorie intake restricted to no more than 2000 kcal a day. - Improvements in weight should be seen after two weeks' use and should continue for another six weeks. Fat loss will be concentrated in the abdominal area. The benefits of Meratrim™ have been confirmed by other studies. - It helps modulate C reactive protein levels by restoring sensitivity to leptin, a hormone secreted by fat cells (adipocytes), the main function of which is to send the brain a message of satiety. Leptin also facilities the destruction, through lipolysis, of triglycerides stored in adipocytes. - Its effects on weight and inch loss are related both to its action of breaking down sugars and carbohydrates by inhibiting the enzyme glycerol 3 beta deshydrogenase, as well as to the effects of alpha amylase, which focuses more on intestinal assimilation of sugars and starches. - It regulates thresholds of adiponectin, a hormone that helps maintain insulin sensitivity of the membrane cells it protects. - Irvingia also helps suppress appetite and studies show it contributes to reductions in body fat. ¤ Green coffee extract, standardised in chlorogenic acid, is particularly rich in tannins and antioxidants, with recognised cardiovascular and arterial benefits. Chlorogenic acid also regulates the conversion of sugars into fat reserves, particularly following a meal. It also has a direct, beneficial effect on weight control without stimulating the central nervous system. ¤ Extract of Coleus forskohlii standardised to 10% forskolin, regulates function of the hypothalamus, the pituitary gland, and in particular, the thyroid. It supports the digestive system by stimulating nutrient-absorbing enzymes in the small intestine, and is also an effective fat-burner through its stimulation of the basal metabolic rate which helps raise lipolysis and thus combats production of adipose tissue. ¤ Chromium polynicotinate , the most absorbable form of the mineral chromium, is an essential element in insulin control, maintaining healthy blood sugar levels and helping to regulate the conversion of sugars into fat reserves. 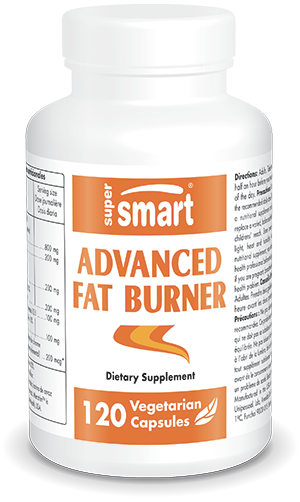 Advanced Fat Burner increases metabolism, burns excess calories, prevents carbohydrate storage and targets visceral fat to melt away unwanted inches. Adults. Take two capsules 30 minutes before the two main meals of the day, or as advised by your therapist.